Could Super Solar Flares Take Us Back To 5000 BC? It is a very simple equation: Energy = Civilisation. Without any form of energy we regress to circa 5000 BC. Energy powers every aspect of our modern lifestyle: clean water, fresh food, lighting, comfortable shelter, mobility, communication, safety and security. Our very own giant hot star, the sun, is earth's primary source of energy. On June 12th, at 00:55 Universal Time, an M2-class solar flare sparked a bright flash of extreme ultraviolet radiation, propelling a shock wave through the sun's atmosphere, and hurling a billion-ton Coronal Mass Ejection (CME) into space. According to scientists at NASA's Solar and Heliospheric Observatory (SOHO), "The sun is waking up from a deep slumber, and in the next few years we expect to see much higher levels of solar activity... at the same time, our technological society has developed an unprecedented sensitivity to solar storms." One needs to go back over 8,000 years in order to find a time when the sun was, on average, as active as it is at present! 3. A bolt of lightning struck a local gasoline storage tank in North Carolina, erupting into a wall of flames that leapt as high as 100 feet and belched a plume of smoke in the shape of an arch across eight lanes of US interstate highway. The one critical factor that did not operate according to plan in many of the recent severe lightning-strikes was the electrical grounding system, which was supposed to draw lightning away from the structures. The sun has begun to awaken and possibly exhale a massive solar storm on planet earth's electromagnetic field. Are several interlocking factors in play that could bring life as we know it to a stand-still via a catastrophic disruption? Our 21st century society is micro-managed by computers, 24/7 internet communications and interlocking electric grids. All are extremely vulnerable to outside forces, both natural and man-made. The National Academy of Sciences 2008 report titled "Severe Space Weather Events -- Societal and Economic Impacts," predicts that our sophisticated technology is vulnerable to a severe solar storm. In a worst case scenario, developed countries with high-tech cities could face blackouts and devastating financial costs 20 times higher than the economic damage caused by Hurricane Katrina. Sometimes catastrophe records are shattered abruptly by a wide margin. Now that it has been recalculated that the BP gusher is spilling over 60,000 barrels of oil a day since April 20th, as opposed to the original estimate of 5,000 barrels per day, this means we are adding the equivalent of one Exxon Valdez catastrophe every four days. So far, that equates to more than 13 times the potency of Exxon Valdez in 1989, and counting. The most dangerous type of solar flares for humanity are the Coronal Mass Ejections (CMEs) that occur during the most active period of the sun's 11-year cycles. This time, the zenith of CMEs is set for 2012 as the solar cycle #24 reaches a crescendo. A CME happens when gas erupts from the solar corona -- "crown" of outer atmosphere surrounding the sun -- and carries a massive amount of radioactive material that can reach earth in three to five days. 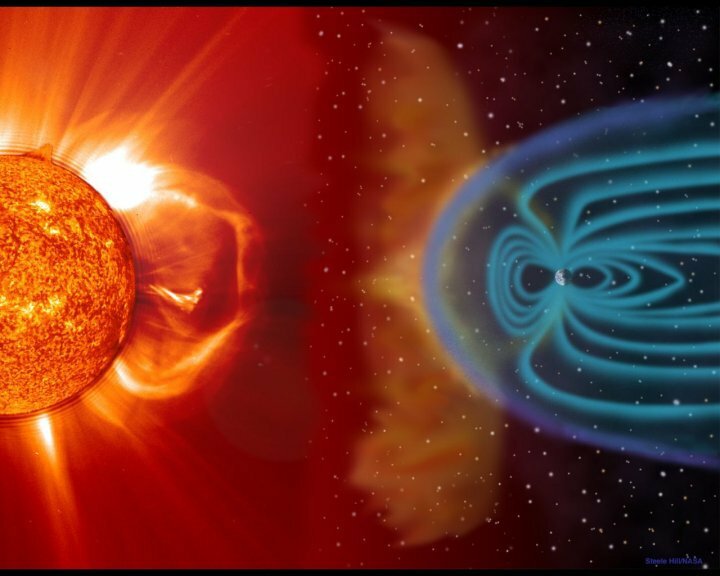 One potentially catastrophic disruption humanity is not prepared for is an Electro-Magnetic Pulse (EMP) or a burst of electromagnetic radiation from a major Coronal Mass Ejection (CME) from the sun. This would create a sudden, massive fluctuation in the earth's electromagnetic field similar to the detonation of a High-altitude Electro-Magnetic Pulse (HEMP) nuclear device. The resulting electric and magnetic fields would then couple with electrical grid systems to produce damaging current and voltage surges. 1. Humanity: We are normally protected from extreme solar radiation by the earth's atmosphere and magnetosphere. Earth's magnetosphere deflects huge bursts of energy and keeps us from cooking like food in a microwave oven. However, strong solar flares can have a significant impact on degrading the earth's magnetic field, letting the harmful rays through. iv. Transportation of food, essential goods and professionals for emergency and healthcare services. If a truly massive Coronal Mass Ejection (CME) hits earth, it could practically take out the world's electricity distribution on a semi-permanent basis. It would take many years, if not decades, to repair the world's electrical system, even if replacement parts were immediately available. There would be massive damage to power generation, distribution facilities, substations and countless transformers and switching equipment everywhere. When high power transformers used in substations or on utility poles are damaged, they must be scrapped or rebuilt. If the factories that create or repair these electrical components are also without power, they will be unable to rebuild or repair electrical equipment. With an AC power outage, there will be no diesel fuel available to fill the tanks of large heavy goods vehicles used to transport and install the massive electrical components. It takes an enormous amount of power to bring a power plant online. This power must come from another power plant. If all power plants were knocked off line, or all those in a specific region, there would be no means to start them back up again. It would take a year or two to get one operational again and additional years to power the rest. So it might be a decade for human civilisation to achieve a semblance of what it was, prior to the paralysis caused by a massive electromagnetic pulse. Earlier this year, when the US DoD tested the effects of an Electro-Magnetic Pulse (EMP) generator, the expected EMP level required to disable vehicles based on previous studies was 30 to 80 kV/m (kilo Volt per metre). However, the DoD began testing at only 5 kV/m. Driving a 2010 Toyota Prius through the path of the EMP generator pulse, the car dashboard immediately went blank and the Prius halted. This is the result of using smaller microchips and circuits, which makes them even more susceptible to EMP. Consider then that our entire 21st century civilisation is completely dependent on computers for power, lifestyle synchronisation, and everything else we do. Yet we don't have any backup in the event of a massive electromagnetic pulse. Bursts of electromagnetic radiation have occurred before, the most notable being the Carrington event when the most powerful solar storm in recorded history hit earth. Just before noon on September 1st 1859, Richard Carrington -- a 33 year old British astronomer -- was observing an image of the sun on a white screen and was drawing the sunspots and solar flares. Suddenly, two beads of intense white light appeared over the sunspots. In sixty seconds the light had significantly diminished, and within five minutes completely disappeared from the screen. Just before dawn the next day, skies all over planet earth erupted in red, green, and purple auroras so brilliant that newspapers could be read as easily as in daylight. Carrington wrote that the glow of the flare brought campers out of their beds. They thought it was morning. They began preparing breakfast! Stunning auroras pulsated even at near tropical latitudes over Cuba, the Bahamas, Jamaica, El Salvador, and Hawaii. Worldwide, telegraph systems -- the only equipment resembling today's Internet and electrical grid in place at the time -- went berserk. Carrington's report makes reference to spark discharges that electrified telegraph lines, shocked telegraph operators and set telegraph paper on fire. Even when the telegraphers disconnected the batteries powering the lines, aurora-induced electric currents in the wires still allowed messages to be transmitted! On March 13th 1989, during the solar maximum of solar cycle #22, the northeast US and eastern Canada experienced a geomagnetic storm as a result of a large solar flare. This disrupted power in Quebec blacking out 6 million people for 9 hours. Like the Carrington event, this also induced current into the lines, causing power surges that melted a transformer in New Jersey. There were also 200 other incidents reported on the North American power grid including a nuclear power plant in New Jersey. What would happen today if another solar flare the size of the 1859 Carrington Event were to hit earth? According to a report by the National Academy of Science (NAS) it could induce electrical currents that would knock out at least 300 main transformers cutting off power to 130 million people, all within 90 seconds. would set us up for dust storms that might dwarf the ones in the 1930s during the Great Depression. We would, as before, probably see mass migrations to more sustainable regions. Some scientists believe an incoming brown dwarf star, several times the mass of Jupiter, is responsible for disrupting our solar system's heliosphere. The brown dwarf has disturbed Pluto's orbit. It is also disturbing the orbit of Jupiter and the rest of the celestial bodies in our solar system. The sun is emitting Coronal Mass Ejections (CMEs) during the last few months that are having a significant impact on the earth's geomagnetic axis and electromagnetic field. We must implement measures to protect our electrical power grids from a catastrophic Electro-Magnetic Pulse (EMP) event caused by a super solar Coronal Mass Ejection (CME). Without intervention our modern civilisation remains utterly defenceless. Clean water, fresh food, lighting, comfortable shelter, mobility, communication, safety and security, would no longer be available or accessible, without electricity. The electrical power grids enable the superior quality of lifestyle and advanced standard of living within our 21st century tightly networked civilisation. Without modern technology at our fingertips, we would collectively revert back to sub-standard survival living circa 5000 BC within a matter of weeks. We no longer have skills or equipment to live as we did a thousand years ago. In such a scenario, sustainable off grid communities -- cities or regions using alternative energy sources -- may fair better. Avoiding some of the damage, they may be able to sustain some degree of normalcy, working infrastructure and capability. The electric grids around the world are dynamic and real time, having no storage. Production is dynamically orchestrated to meet current demand. Given that we do not have storage of energy and depend on a real time system, this is a severe vulnerability which also decreases efficiency. However, backed with USD 75 million in US Department of Energy smart grid demonstration grants, the first large-scale distributed battery storage project is being started in the US. to take special precautions for the future when a colossal solar storm surges through earth. Smaller components and communications equipment -- necessary to maintain continuity of operations during an emergency -- also need to be protected from an EMP event. The time to initiate pre-emptive action is now, before a super solar flare takes us back to circa 5000 BC?